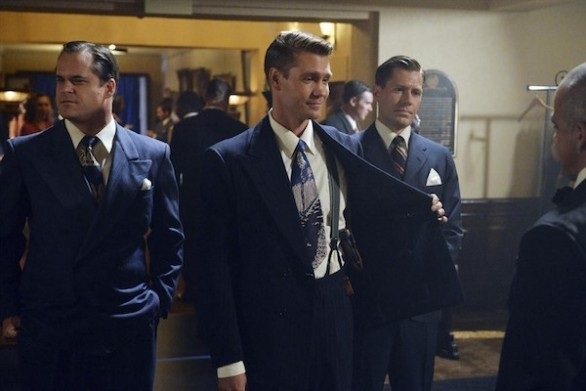 In the first part of the mini-series where we follow Peggy Carter (Hayley Atwater, Captain America: The First Avenger) as she balances her everyday job while doing secret missions for Howard Stark (aka Tony Stark/Iron Man’s dad) during the 1940s. Fans of the comic book and of the TV show Agents of SHIELD, have learned or know that Hayley helped create SHIELD which is the basis for the whole Marvel universe. The story of Peggy Carter of course starts in Captain America The First Avenger. She remembers how Steve Rogers/Captain America (Chris Evans) crashes the plane in to the water. It is now 1946 and she is still having a hard time moving on. Stark (Dominic Cooper, Dead Man Down) is in trouble with the Government for being accused of selling weapons to the enemy. We see where Stark gets his arrogance and sarcasm. SSR is trying to bring Stark in for the Government and Thompson (Chad Michael Murray, Southland). 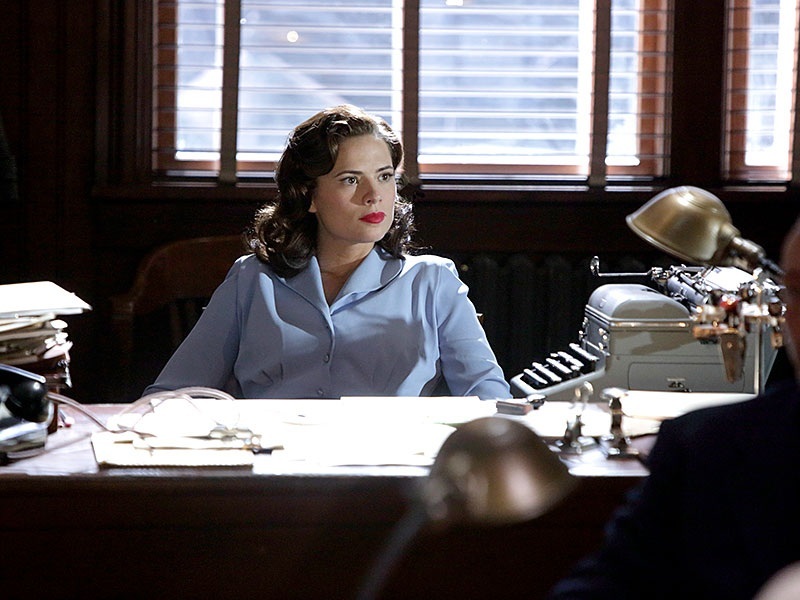 And we quickly see that Peggy is seen as the ‘secretary’ for the SSR and has no respect with the males of the group. Looks like she got a seat at the table because of her work with Captain America and they don’t see that as a reason to respect her. Stark knows that the only way that he can prove his innocence is with the help of Carter. He says that someone stole his ‘bad babies’ (bad inventions) and selling them on the side. He tells her about a dangerous weapon that’s about to hit the streets, Electro Mitnomine. Which creates a big explosion if in the wrong hands. Carter gets to work and tries to get information. There is a man named Raymond who is rumored to have the information. With the little information that she got to get into the club, Carter gets to work on getting in the club. When she gets into the safe, she finds that it’s more then just a formula. It looks like it’s an Infinity Stone aka the Tesseract. Carter takes it back home and makes a homemade stabilizer for the device, which turns out not to be the Tesseract, but her actions cost her friend, Colleen her life. Carter finds out some more information on the device and learns that it was made up of Gamma Rays. Something similar to what was used with Rogers. In what looks like the first form of messaging, the man, Vanko (Costa Ronin), who had tried to buy the device asks whoever he’s working for if he can kill Carter. Wouldn’t be surprised if Vanko is talking with Whitehall. Carter finds out where they are using the formula to make more of the bombs. She sees that one of the men that is making the formula, he’s got the same scar on his neck as the man who tried to kill her. He warns her that the future is not going to be pretty for them. Not something that she hasn’t heard before. This is all right before he blows up the factory. Stark’s butler and Carter’s partner, Jarvis (James D’Arcy, Let’s Be Cops) and her get out just in time. SSR finds out about the building explosion and it makes it so that Thompkins forgets about the picture that he might have of Carter at the club. It looks like there is more to the story with Stark wanting her help. Jarvis talks with Stark about how she’s ‘perfect for the job’ and how ‘she will never suspect a thing’. What could he be talking about? Vanko starts looking for information on Leet Brainnis and the device (which there is a milk truck full of somewhere around the city). And Carter tries to find the truck. She gets a name, Sheldon, where she thinks that the stuff is. When Carter learns that her picture might have been taking at the bar, she tries to keep the information from getting to Dooley. At least on the plus side, it’s her only friend at the SSR, Sousa (Enver Gjokaj, Extant), who is combing through the pictures and not Thompkins. Meanwhile, SSR try to figure out what happened at the factory. Dooley (Shea Whigham, Non-Stop) thinks that Stark is responsible. Guess in a way, he is, considering it IS his formula. And the fact that he tried to buy the factory before is not helping is case. Dooley/Thompkins learns that Stark is working on a new formula with Molecular Nitromene (fire nitrogen). So, Thompkins and Carter are going to scan all the employees of Jones (the man who owns the factory) to try and find the mole. Carter recognizes one of the employees (last name Van Eert) who was at the factory but he passes the test. Now we can’t have that. Once again, carter proves she’s smarter then any other agent by figuring him out and catching him. Dooley/Thompkins interrogate Van Eert. And they use old school tactics in order to try and make him talk. But he doesn’t offer anything. But Sousa gets a break as he gets a name Sheldon McFee. Which just so happens to be where Carter and Jarvis are. Looks like the man from the factory (who is Leet Brannis) is there. She offers him protection for him to talk but he won’t without a promise of a deal. On the way around from the house (without Sheldon because of course he got away), Vanko shows up to try and get the truck, while Dooley/Thompkins find Sheldon. Vanko and Carter fight on top of the milk truck before she is able to destroy the truck, it’s contents, and kill Vanko, and killing Brannis by accident. Before he dies, he draws her a picture of a heart, with some kind of wave through it. It’s a symbol obviously and will help Carter find out where the rest of the inventions are. Sousa finds a key that Vanko dropped. It looks like it’s to his hotel room. Surprising that Carter didn’t notice that. Carter helps the guys look over the photos and see that they only get the back of her head. Jarvis tries to talk some sense into Carter as she is trying to shield herself from the world and not let anyone get close. Not completely crazy since Steve and Colleen died on her. Maybe Jarvis does have a point. She takes her friend Angie up on her offer to be her neighbor. By the end of the show, Ray finds the license plate of Stark’s car. There is the nail in the coffin for him. In the next part, Carter learns that it’s going to be hard to trust anyone in her life, including Stark and Jarvis, while learning that there is a bigger picture to the story that she is now involved in. 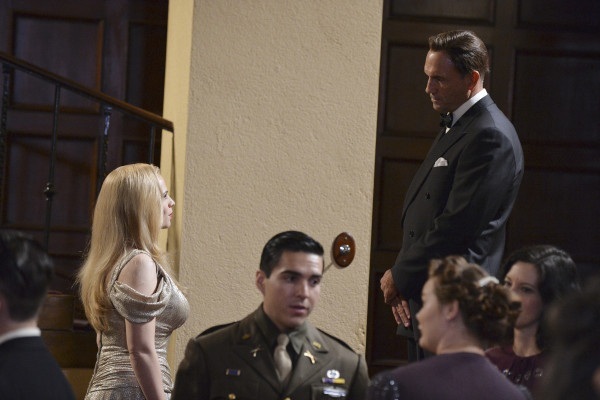 This entry was posted in TV and tagged ABC, Agent Carter, Agents of SHIELD, Captain America: The First Avenger.